In another of the bellwether lawsuits involving metal-on-metal hip implant devices manufactured by Johnson & Johnson subsidiary DePuy Orthopaedics, Inc., a Texas federal jury awarded a total of $247 million in compensatory and punitive damages to six patients who claimed that they had been injured by the devices. Among the causes of action for which the jury found DePuy and J&J liable were strict liability design defect, manufacturing defect, and failure to warn, plus negligent design and manufacturing, negligent and intentional misrepresentation, and fraudulent concealment (In re DePuy Orthopaedics, Inc. Pinnacle Hip Implant Products Liability Litigation, November 16, 2017, Kinkeade, E.). Six individuals who allegedly had sustained metallosis-related blood, bone, and tissue problems after having been surgically implanted with a Pinnacle hip replacement device containing a metal-on-metal Ultamet liner (Pinnacle MoM) designed, manufactured, marketed, and sold by DePuy Orthopaedics, Inc. filed suit against the company and its corporate parent, Johnson & Johnson (J&J). According to the plaintiffs’ complaint, the Pinnacle MoM device was designed, developed, marketed, and sold for human hip joints damaged or diseased due to, inter alia, fracture, osteoarthritis, rheumatoid arthritis, and avascular necrosis. Specifically, the device was designed and sold to provide pain relief and consistent/smooth range of motion, and the defendants marketed the device as having significant advantages over other hip devices and hip replacement systems. Furthermore, when problems became apparent with DePuy’s "ASR" hip implant (another metal-on-metal design), the device maker relied on its status as "a Johnson & Johnson Company" in an attempt to restore confidence among surgeons and to encourage them to use the Pinnacle MoM in place of the ASR hip implant after it was recalled. All of those actions were taken with the knowledge, approval, and encouragement of J&J, the plaintiffs contended, adding that the corporate parent directly participated in promotional and marketing efforts to promote the use of metal-on-metal hips in general and the Pinnacle MoM device in particular. Despite their marketing of the Pinnacle MoM as safe and superior, the companies knew that the devices could result in metallosis, biologic toxicity, and unreasonably high, early failure rates. Moreover, the companies were aware that Pinnacle MoMs could result in unsafe release of toxic metal wear debris and metal ions into hip implant recipients’ tissue and bloodstream, and that metal particles from Pinnacle MoM devices can result in tissue death, bone erosion, and the development of "pseudotumors," as well as severe inflammation, severe pain, tissue and bone loss, and other related diseases. Among the causes of action alleged by the patients were strict liability (design defect, manufacturing defect, and failure to warn), negligence (negligent design and manufacture, negligent undertaking, and negligent misrepresentation), intentional misrepresentation, fraudulent concealment, and state-law deceptive practices, as well as an aiding and abetting claim against J&J. The lawsuit sought both compensatory and punitive damages, plus loss of consortium on behalf of the patients’ spouses. Liability for claims. 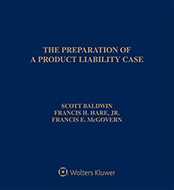 The jury found in favor of the plaintiffs against both DePuy and J&J on the patients’ claims for strict liability (design defect, manufacturing defect, and failure to warn) as well as negligent design and negligent manufacturing. Both companies also were found to have negligently made false representations regarding Pinnacle MoM devices to the implanting surgeons and the patients, upon which the surgeons had justifiably relied and their reliance had been a substantial factor in causing the patients’ harm, the jury determined, finding that the companies also had engaged in intentional misrepresentation with respect to the surgeons but not with respect to the patients themselves. In addition, the companies fraudulently concealed facts about the Pinnacle MoMs to both the patients and the implanting surgeons, and that conduct constituted materially deceptive/misleading acts under Texas’ deceptive practices law. Furthermore, the jury found against J&J on the plaintiffs’ claims for aiding and abetting in DePuy’s tortious conduct relating to all of the above-mentioned causes of action. Compensatory damages. In addition to being awarded past medical expenses, each of the six patients was awarded between $800,000 and $3 million for their past pain and suffering, plus between $1 million and $3 million for future medical expenses and up to $12 million for future pain and suffering. The four married patients’ spouses were awarded between $100,000 and $600,000 for past loss-of-consortium damages, but none of the spouses received compensation for future loss of consortium. Punitive damages. Concluding that the plaintiffs were entitled to punitive damages, the jury also awarded a total of $28 million to each of the six patients—$13 million of which was against DePuy and $15 million of which was against J&J. Attorneys: Richard J. Arsenault (Neblett Beard & Arsenault) for Ramon Alicea and Carole Alicea. Michael V. Powell (Locke Lord LLP) and Jessica D. Miller (Skadden, Arps, Slate, Meagher & Flom LLP) for DePuy Orthopaedics Inc., DePuy Products Inc. and Johnson & Johnson Services Inc.
Companies: DePuy Orthopaedics Inc.; DePuy Products Inc.; Johnson & Johnson Services Inc.